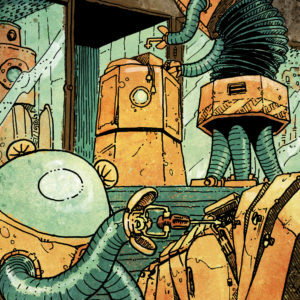 Last week I published my first RPG product, an OSR module entitled Automata Run Amok designed to be an introductory adventure for low-level characters. I’ve been pleased with the reception so far and, barring unforeseen circumstances, there will be a much more substantive follow-up publication next year. Before going to work on that new project, though, I thought it might be good to discuss explicitly some of the design choices that shaped Automata. This post is the first in a series to tackle that subject and it focuses on that topic of perennial debate at the heart of most modules: map keys. The alternative to this ‘Platonic ideal’ approach is what I guess could playfully be described as Aristotelian — an empirical approach to map key information design based on observation and direct experience of what really happens at the gaming table. There have likely been examples of this throughout the history of the hobby, but the explosion of small publishers and other hobbyists dissecting and philosophizing about RPG design has intensified the drive to innovate the map key. Of course, like anything based on observation and direct experience, this innovation has led to a number of competing and idiosyncratic approaches. I will not even attempt to describe this variety except to say that, generally, these methods favor the hierarchical arrangement of information based on its perceived importance to play and the use of formatting to provide visual cues so DMs can quickly parse what is being presented. My work in Automata Run Amok borrows shamelessly from what I feel to be the best examples of this ‘Aristotelian’ map key design, distilling the practices and recommendations I have encountered over the last few years into what I hope is something solidly useful if not innovative. This makes an excellent example for three reasons: there is quite a lot of stuff for characters to investigate, its default state is rather static in terms of opposing NPCs and monsters, and it integrates some non-key elements of the module like its random tables and timeline. Even before diving into those details, though, notice how certain items are called out using color or styling (i.e., italics and bold-face) while the key entry largely consists sub-headings and bullet lists to create a clear hierarchy of information. 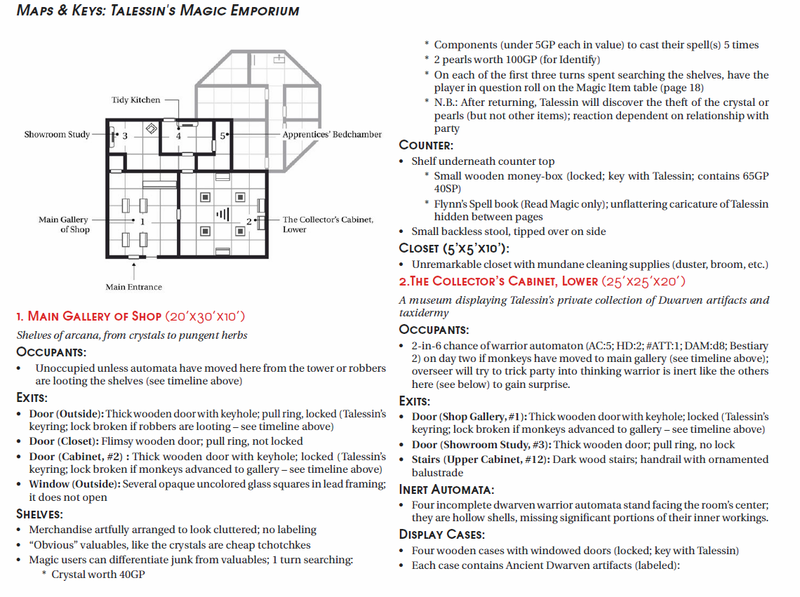 Comparison with the entry for the second room shows that this layout is consistent so that, once the Dungeon Master learns the module’s visual vocabulary, he or she knows everything necessary to parse subsequent entries on-the-fly. Room number, name, and dimensions (larger red font): As the only non-black font in the module, the red titles for each entry clearly divide up the key’s entries instead of relying on spacing alone to convey this information. This allows the DM to find the entry’s beginning quickly and jump back-and-forth between the text and map without losing his or her place. The number’s purpose should be self-explanatory, while the name of the room simultaneously provides a shorthand indication of what kind of location is being described and makes sure there’s enough text for the red font to stand out. Finally, the dimensions are given in the top line since the player group’s mapper (remember, this is an OSR module!) will need this information. 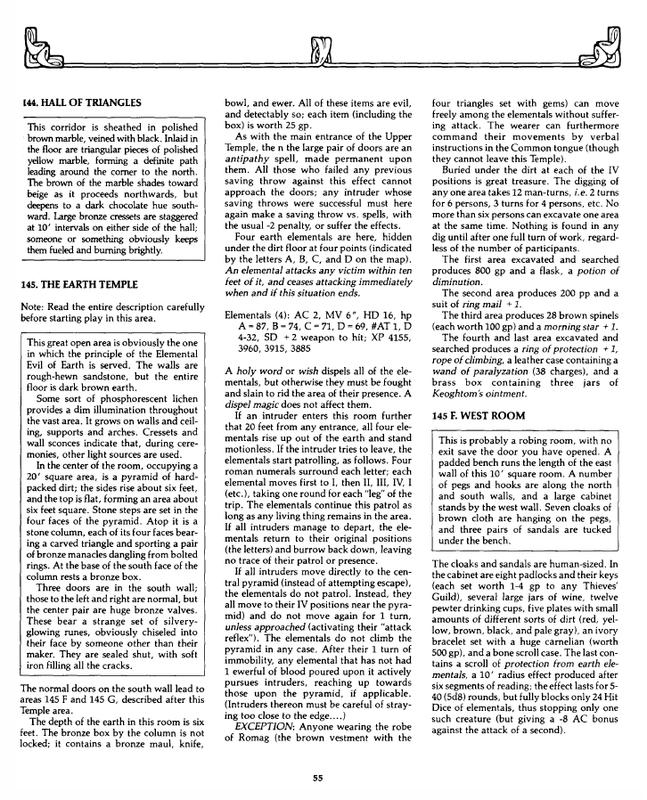 My habit when Dungeon Mastering is to give mappers the information they need early in the description unless there is a logical reason — such as a huge chamber or attacking monsters — that would prevent someone from quickly eyeballing the size of the room. That allows them time to sketch and revise even if the party is prone to moving along quickly from location to location. 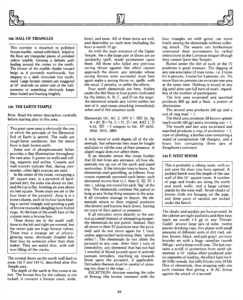 Brief evocative phrase (italic font): Quite a bit of the debate surrounding RPG map keys involves boxed text and I tend to agree with the argument that blocks of read-aloud for the DM are largely useless or even counter-productive at the table. It constrains the tone of the game to whatever the module author thinks is appropriate for a “typical” group and assumes a level of patience and attention to detail among players that I have rarely encountered in an individual let alone an entire party. However, ditching boxed text does limit the module author’s opportunities to convey the non-visual elements of a room that would be immediately evident — its smell, sounds, and general feel. My compromise is this evocative phrase, which describes the flavor of the room yet still allows the DM to couch that information in whatever tone or style fits their gaming group. For example, this particular room has “shelves of arcana and pungent herbs” — in other words, it’s a crowded shop of curios of mysterious origin suffused with the smells of magical ingredients. My opinion is that a DM doesn’t need more than this to describe the room in appropriate terms according to the needs and attention span of their player group. Subsection listing and describing exits (bold-face header with bullet list of details): Once the players know whether there’s anything in the room, the next thing they need to know is where the available exits are located and whether those exits are barred, locked, or otherwise impeded. This is also the next thing the party mapper will need to know once the outline of the room is sketched and therefore appears towards the beginning of the entry. 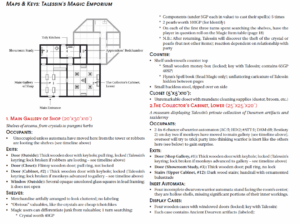 Series of subsections listing items of interest (bold-face headers with bullet lists of details): The last thing a DM must provide players is a list of miscellaneous items within the room that can be interacted with or investigated. My intention here is that only the headers would be shared during the initial room description and that the additional information detailed in the bullet lists would only be disclosed if the party spends time (i.e., expends resources) to look more closely at the item in question. So, in our example, the DM would let the party know that there are shelves covered in items, a counter, and a closet in the shop. In most cases, I imagine, the party will be interested in seeing exactly what’s on the shelves and choose to spend a turn investigating those; at that point only they would learn that these contain objects “artfully arranged to look cluttered with no labeling,” including several large crystals (one of which is valuable), spell components if a magic user is doing the searching, and something special from the random magic item table. Similarly, if the party or member thereof spends a turn investigating the counter, they will find the shelf underneath with the book and money-box. So that basically demonstrates my Aristotelian style of map keying, which leverages visual cues and the hierarchical presentation of information to make running the adventure at the table a smoother experience requiring less preparation. The page layout supports the structure of the key entries, with each two-page spread in the module containing all the entries relevant to the map (an innovation lifted from Maze of the Blue Medusa) and trackers with check-boxes and blanks for the DM to note the passage of time, defeat of enemies, and other changes to the location (suggested by my editor and illustrator, Luka Rejec). When printed out, all of this information would be visible at once and (hopefully) easy to interpret even with the reality of excited players, imperfect recall of module details, and a tone that in my experience inevitably oscillates between epic and farce.